Temple is open for 24 Hours. 5.00 AM to 6.00 AM – Panchamruthabhishekam, Sahasranamarchana, Balabhoga Nivedhana. From 6.00 AM – Sarva Darsanams. 11.00 AM to 11:30 AM – Cleaning of Temple. 11:30 AM to 12.00 Noon – Panchamruthabhishekam, Astotharanamarchana, Rajabhogam, Mahanivedhana. From 12 Noon – Sarva Darsanams. 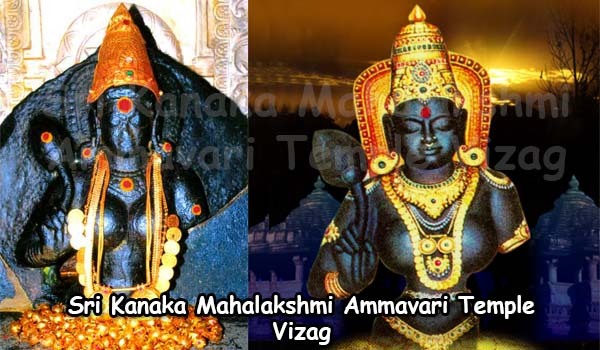 5:30 PM to 6.00 PM – Cleaning of Temple. 6.00 PM to 6:30 PM – Panchamruthabhishekam, Astothara Sathanamarchana, Sayamnivedhana. 6:30 PM to 5.00 PM – Sarva Darsanams. KumKum Pooja – Performed from 7.00 AM to 9.00 PM. Ksheer Abhishekam Pooja – Performed on every Friday from 8.00 AM to 9.00 AM. Every Friday Ksheer Abhishekam is will be performed at 8:00 AM. devotees has to pay Rs.200/- for this pooja, besides other Sevas such as `Sahasranama Puja on Tuesday & Friday, Samuhika Astothara on Thursday & Fridays & Astothara Kumkumarchana regularly. Ksheerabhishekam is done on every Fridays from 08 am to 09 am. For more info you can call to temple official at – Ph:0891-2566515, 2568645, 2711725, 2566514 (Temple) Cell: AEO: 9703720332, 9849861458. Sir srikanak Mahalaxmi temple Vishakhapatnam. Distance from Vishakhapatnam junction.plz message me. PL LET ME KNOW HOW CAN I BOOK ./ CAN U PL RESERVE ME A TICKET. MY DETAILS ARE BELOW..
Reach the temple ticket counter one or two hours prior to the mentioned of Abhishekam time and you will get it and there is no online booking.